If any users for the Hunting Logs notice any errors in the Hunting Logs, please post to this thread to report them. Firefox: Cel, check Twin Adder Hunting log rank 1. Number 6 is wrong. Wrong zone and wrongly numbered. ARC and MRD hunting log rank 2, Rothyt Pelican is listed as being in Middle La Noscea - 3 Malm Bend. Should be Western La Noscea - Skull Valley. 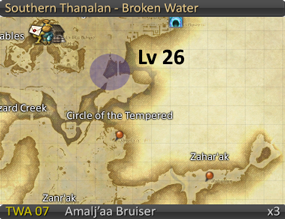 Lancer Rank 3 Smallmouth Orobon - map says Upper La Noscea but it's a map of South Shroud - Upper Paths. Map is correct, just not the top map description. Thanks for reporting that, Katt. 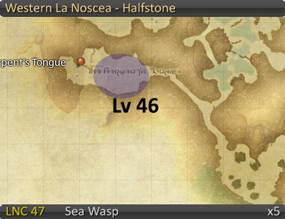 Lancer Rank 4 Basalt Golem and Ringtail - map says Central Shroud - Sorrel Haven but it's a map of Outer La Noscea. Map is correct, just not the top map description. 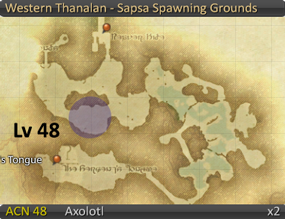 Image shows it as being in Southern Thanalan near Ala Mhigo. The Bruisers are there, but the Ranger is actually in Eastern Thanalan, Wellwick Wood, at 20,25 - directly east of Highbridge. Sea Wasps are no longer in this location but are now up the road to the left. Gladiator Rank 4. Treants are in South Shroud and so is the posted map not Dragonhead. Map is correct though. THM rank 4, entry THM 36: Plasmoids. Everywhere online agrees with the hunting log here, but the Plasmoids there are actually level 41, not 34. Sounds like the Plasmoid issue was fixed in a recent patch. Thaumaturge 43 - 3rd Cohort Secutor. The map shows the incorrect location. The actual location for those types are in the area directly to the east. It's also missing Thaumaturge 48 entry: Ked x6 in Urth's Gift. Page created in 0.314 seconds with 49 queries.